Cheers sports fans, get your game face ready, it's time for the ultimate tournament! To kick off our 2019 March Madness Hazy IPA Tournament, Modern Times Orderville Hazy IPA is going up against Samuel Adams New England IPA: a nail-biting matchup that will come down to the wire. 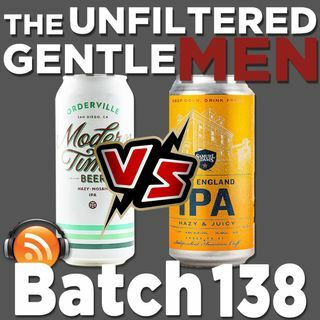 Greg talks about his last minute trip to have Pliny the Younger with some friends, Dan and Greg report on their field trip to Flat Fish Brewing for their big Resilience IPA tasting event. Frankie G calls in to ... See More explain the proper way to play beer pong. In Sports News: Zion Williamson suffers a blowout on the court, Robert Kraft spends too much time in Florida, the Lakers are looking for a coaching change, bad news for Clayton Kershaw has a rough start, and more. In Booze News: AB InBev is acquiring a new beverage company, a study finds weedkiller in beer, Heineken is laying off 15% of their workers, Molson Coors is cooking the books, beer shipment grew in January, Bud Light angers the beer industry and more. Our Beer Babe of the Week is Mandi, follow her on Instagram @ipabae! Old Timey Word of the Week: "Ace of Spades.” Use it in a sentence on social media and tag us for a shout out!